Home, the best place on earth. Size: 4 inchesIf you’ve been wondering what to do with the rectangular-shaped space above your French doors, wonder no more. 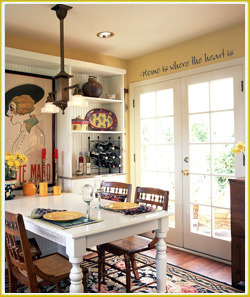 That space is custom-made for our transferable inscriptions and sayings – the latest trend in home decorating. These transferable words are so easy to apply that anyone can do it, even those who are, shall we say, “decorating-challenged.”What exactly are transferable inscriptions and sayings? Well in this picture, it’s the quotation above the door that reads, “Home is where the heart is” but in your home, it could be practically any message you want to display. The message looks like it’s made using a stencil, but it’s not. The homeowner didn’t hand-paint this message, either. In fact, no paint is used at all. Instead, this homeowner simply unrolled her message onto the wall and rubbed out the letters to create this inspirational message that has the look and feel of paint, but without all the mess.It was easy to get the letters perfectly spaced apart because that’s how they arrived. The spacing, measuring, pasting and cutting of the letters that make up the message is all done before it arrives in your home. Really, it doesn’t get any easier than that. The most difficult part of this entire process might just be deciding which of the hundreds of transferable inscriptions and sayings you want for your space. You also get to decide the lettering style and the color you want for your message, and that’s what adds to its uniqueness.